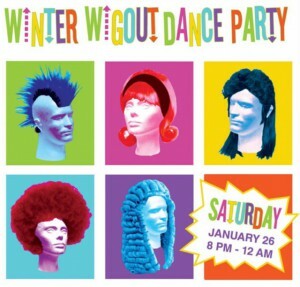 Get decked-out for a wigtastic evening of dancing and wig-wearing reverie! $7 admission benefits the UMaine Museum of Art Alliance and the Bangor Arts Exchange ans its anchor tenants (Bangor Symphony Orchestra, Launchpad and the Bangor Ballet). Meet the Wigovenors, take a photo with the BIG-WIG and dance all night long to the sweet beats served up by DJ Thermomatt. Stack it to the Max – what ya got to lose? Support your local arts organizations while getting wiggy with it!